What are some of the ways that artists can depict strong light? Before leaping into a discussion about the various approaches used by artists to represent strong light, I first need to offer an important insight into how meaning is expressed as it impacts on this topic. Interestingly, one of the oddest conundrums facing artists when they wish to express their ideas in the visual arts is that ideas are best expressed by showing their complement (i.e. the opposite of what is intended to be communicated). This sweeping statement may sound absolutely weird and even completely nonsensical at first, but let me explain. If an artist wishes to convey, for example, the notion of femininity, the artist may choose to feature in the artwork subject material that is commonly considered to exemplify femininity: curvaceous women, cows with big soft eyes or pink fluffy boudoir chairs—my apologies if pink fluffy boudoir chairs are no longer seen as feminine. By simply featuring such subject material in an artwork, however, does not guarantee that a viewer will understand the artist’s intention of expressing the notion of femininity. Indeed, a viewer may only see an objectification of the portrayed subject (i.e. 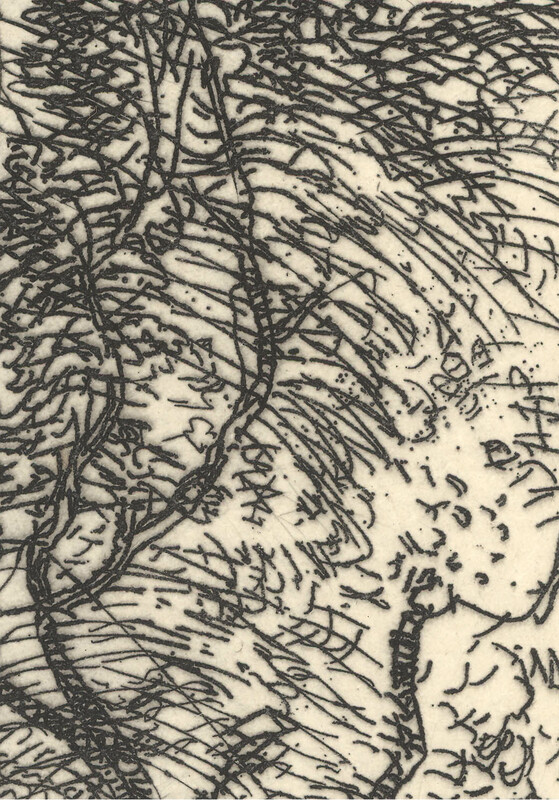 the viewer may see the featured subject as a specimen without any other meanings). To ensure that the viewer moves beyond looking at the subject as raw pictorial data without attached meanings the context surrounding the subject is very important, as it is the specific context that projects the artist’s meaning. For instance, if the artist wishes to show femininity, the subject it needs to be compared to something that does not exemplify femininity: straight lines of architecture may accentuate a curvaceous woman; sharp blades of grass may accentuate the doe eyes of a cow; dirt, grease and tools of manual labour may accentuate the colour and fluffiness of a lady’s boudoir chair—again, my apologies for gender casting. In short, visual expression of ideas is facilitated by juxtaposed contrast of dualities and the clarity of the expression rests with how well orchestrated the contextualisation is managed. With regard to portraying strong light, the same focus on contextualisation is needed. 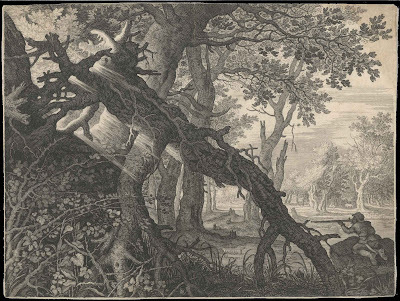 In Aegidius Sadeler’s (1570–1629) The Rabbit Hunt (shown below) for example, a shaft of light follows the course of a fallen tree angled from the upper left. 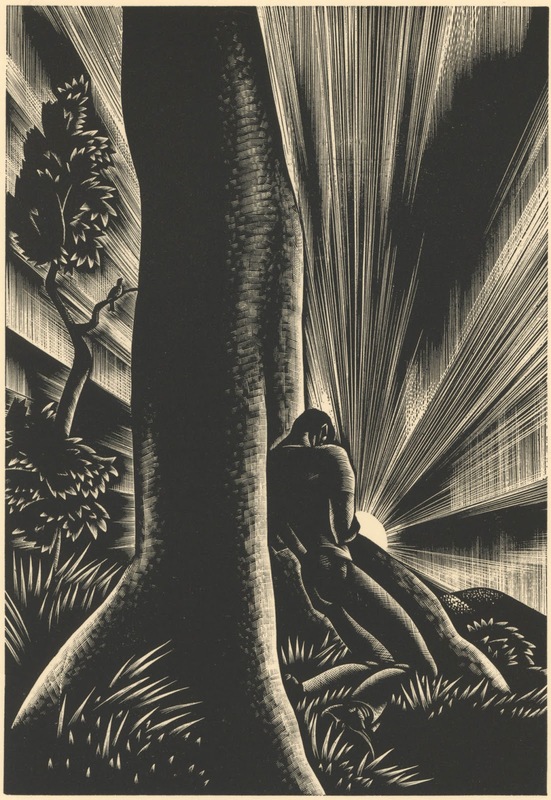 The light is contextualised as intensely bright by the sharp tonal contrast it makes with the tree and its immediate dark surroundings. Or to express this slightly differently, the brightness of the light is depicted as intensely bright relative to the darkness of the surroundings. 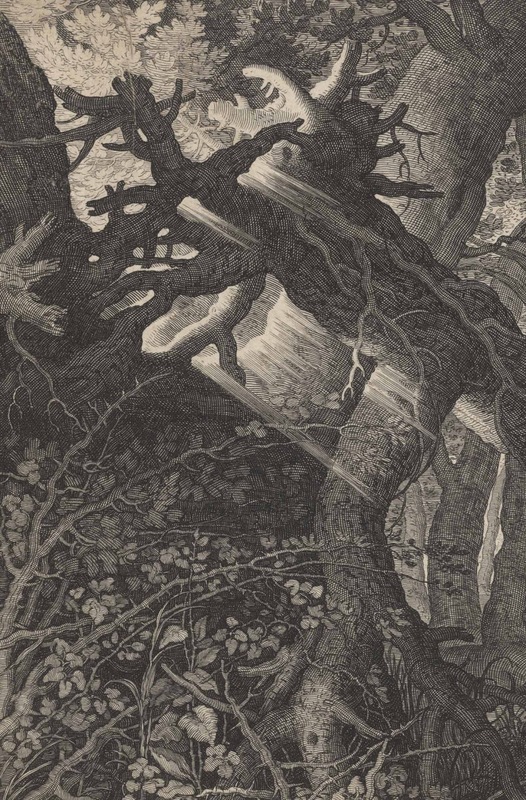 Of course, there is more to creating the effect of intense light than employing strong tonal contrast like a bright spotlight on a darkened stage and in the following explanation I will address four visual devices that artists employ: the Holly and Cloverleaf Illusion (i.e. use of convex and concave forms to present the illusion of light as a volume); agitrons (i.e. use animation marks to give the illusion that light is moving in a direction); repoussoir (i.e. use of subject material overlapping the light source to suggest the level of the light’s intensity) and transition of mark attributes (i.e. use of different attributes of line to signify different effects of light on a subject). Condition: a fine impression of a rare and important landscape. 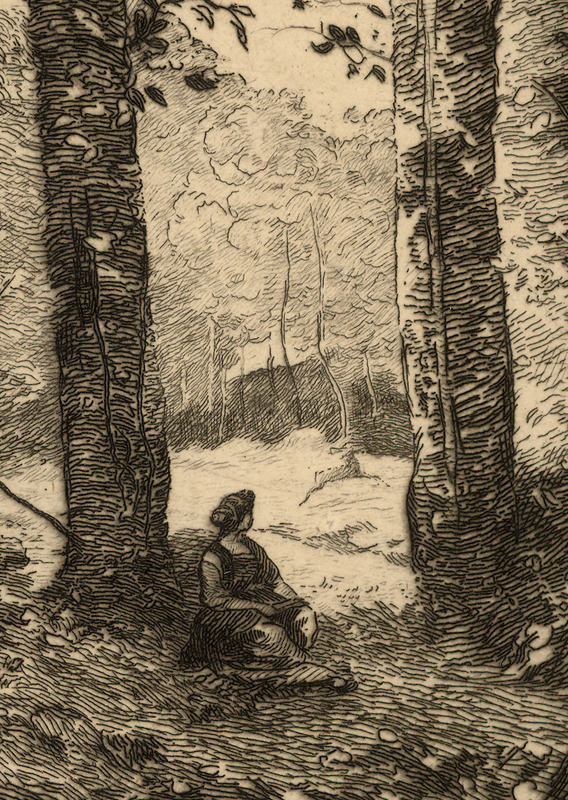 The print is trimmed to the plate border without text line. 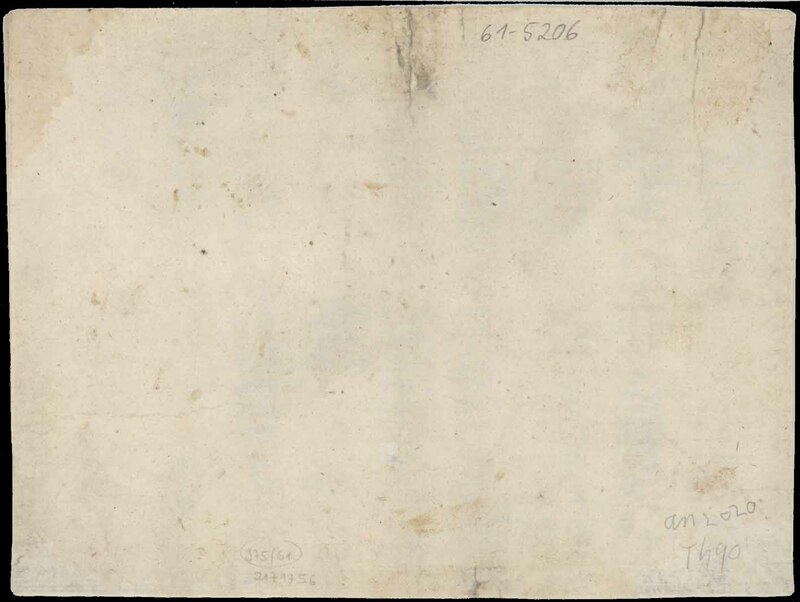 There is a closed tear in a middle fold reinforced verso at the top and bottom; otherwise in very good condition with no stains. I am selling this print for $780 AUD including postage and handling to anywhere in the world. Please contact me using the email link at the top of the page if you are interested or click the “Buy Now” button. 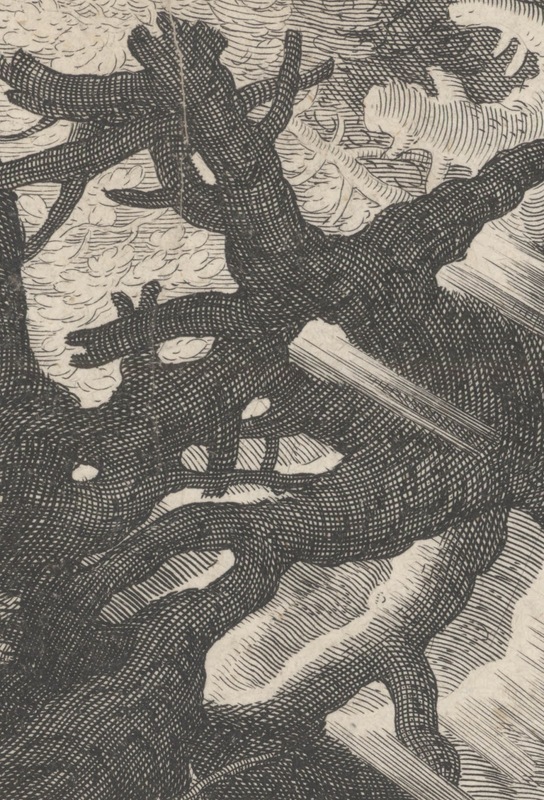 The mechanics of the first of these visual devices, the Holly and Cloverleaf Illusion, is discussed in the earlier post, Earlom and Lorrain: Holly and Clover. Consequently, rather than revisiting this explanation, I will focus here on how it may be used to represent brilliant light. One dark and brooding image exemplifying the use of the holly leaf representation of light is Maxime Lalanne’s (1827–1886) etching, Baie de Weymouth [Weymouth Bay] (shown below). 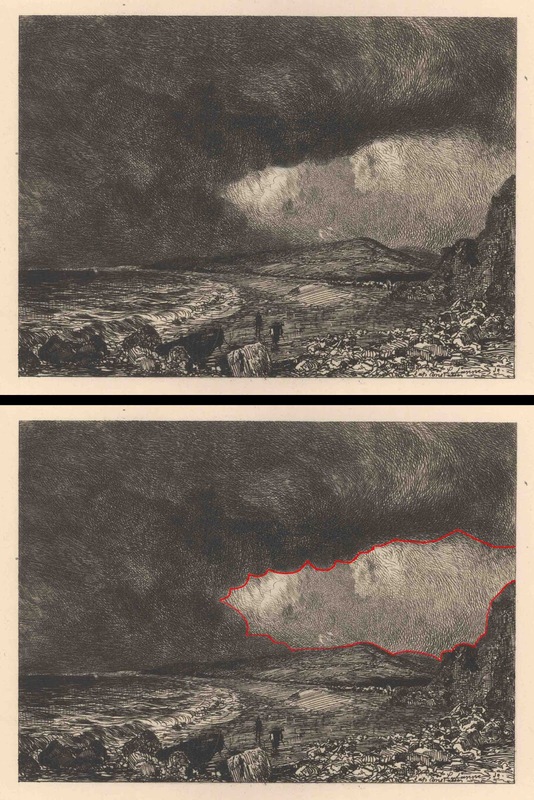 In this small but striking panoramic view of the beach at Weymouth the bulging shape of this illusion features in the distant patch of sky framed by dark clouds (see the diagram further below where this shape is marked out in red). Resulting from the illusory effect wherein this shape tends to be perceived as laying on top of the dark clouds (i.e. in front of the clouds) the implication is that the effect of light is a thin veneer rather than appearing to possess spatial depth. Published in The Portfolio (vol. 4, p. 161). Condition: a strong impression in pristine condition. I am selling this print for $87 AUD including postage and handling to anywhere in the world. To demonstrate the difference in effect between this patch of sky with its present arrangement of bulbous convexities like a cloverleaf, to a pattern of concavities like those of a holly leaf, compare the original image (shown above) with the digitally altered image below. 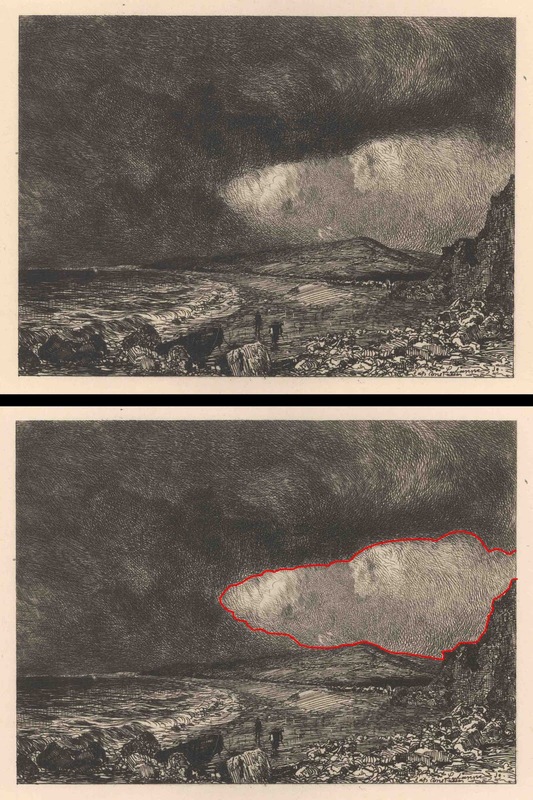 From a personal viewpoint, the altered image portrays the light in the sky as behind the clouds and as an illuminated void. By contrast, the position of same area in the original image appears spatially ambiguous and bulging forward rather then receding. Going further, I wish to propose that a convincing representation of light is best expressed with a clover leaf configuration of foreground subject matter. 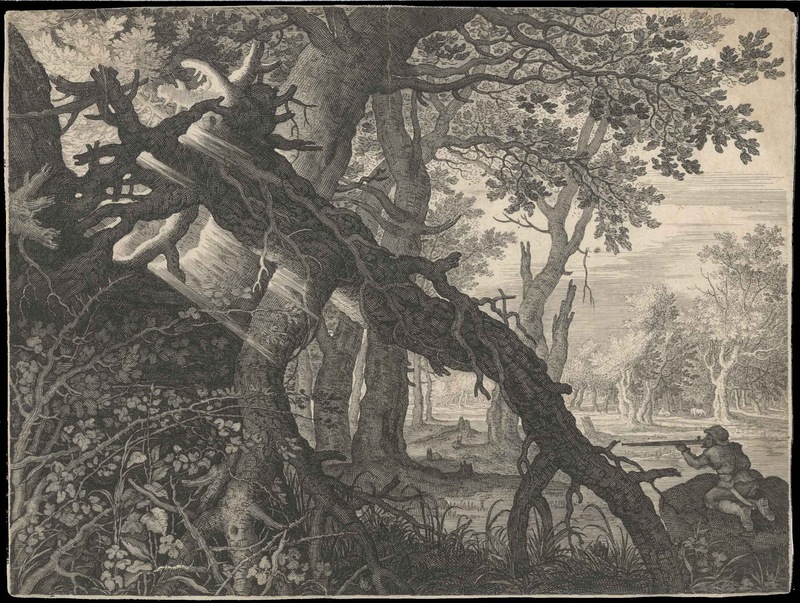 To my eyes this is validated by the detail of Sadeler’s Rabbit Hunting shown further below where the convex shapes created by the roots of the fallen tree pictorially “push” the light behind them while the contrast of the roots’ dark tones creates the illusion of intense brightness. Arguably the most often employed visual device for representing strong light is the agitron also called an animation mark. This is especially true for the representation of light emanating from the head of Christ and other religious luminaries and there are many variations of how agitrons are used to portray this radiance. For the present discussion, however, I wish to focus on natural light from the sun, as the representation of this type of light is probably the same for all the different types of light. 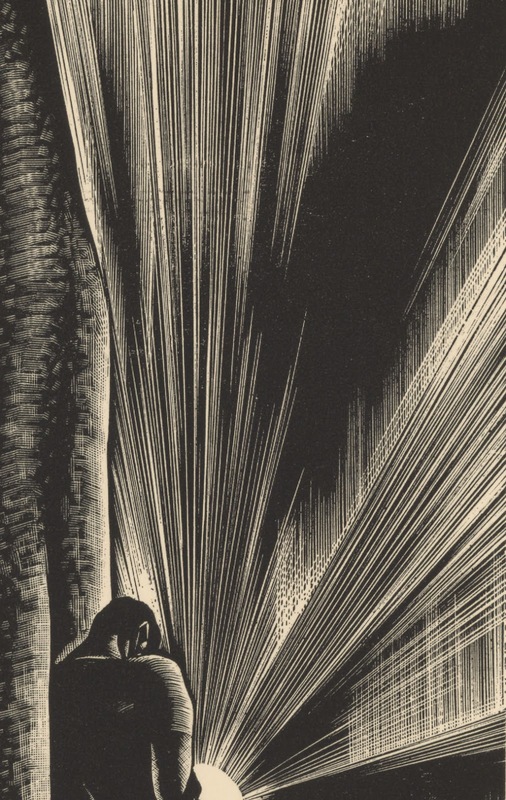 Lynd Ward (1905–85) is an ideal exemplar of an artist employing agitrons and his skilful use of them to express the light is epitomised in the untitled illustration (shown below) that I will title for expedience as #44, because it is the forty-fourth full-page illustration in his unpaginated graphic novel, Wild Pilgrimage. 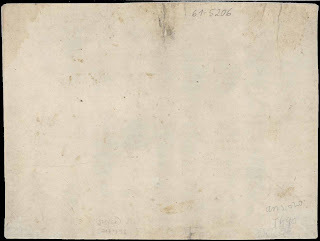 Condition: verso has hinge remnants at the top of the leaf and an ink stamp and signature of a previous collector; otherwise the impression is a strong and clear and the paper is in pristine condition. The agitrons in Ward’s #44 express the fading light of the sun in three ways. The most obvious of these ways is the use of radiation, in that the fine radiating lines from the sun represent in graphic terms the brilliance of the sun itself. More subtly, the lines thicken in their size as they move away from the sun. 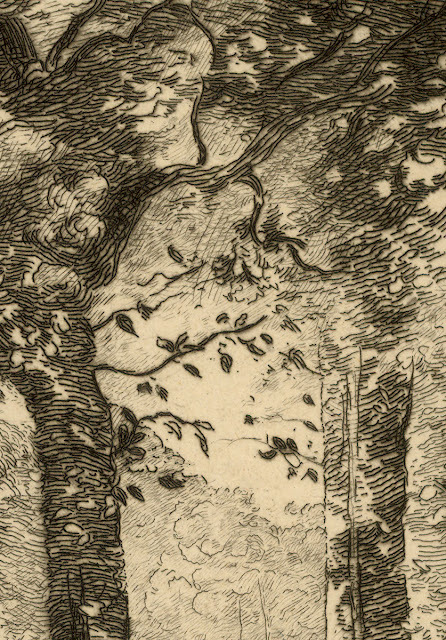 This transition in size functions as linear perspective in disposing the sun into the distance. It also lends the suggestion by virtue of the minimal changes in the width of the lines and, importantly, their length, that the sun’s light is ebbing. The third way that Ward’s agitrons project fading light is very inventive and demonstrates why he is a fine illustrator. Note how he has interrupted the outward flow of lines from the sun with a pattern of vertical blockages ranging from finely hatched vertical strokes and stippling towards the right side of the image and a softly delineated black shape—arguably a cloverleaf shape with all its implications discussed earlier—towards the upper-right corner (see detail below). Ward’s idea of employing visual interruptions to a viewer’s reading is not in itself an unusual practice even if his application of them is subtle, refined and insightful. For example, repoussoir is a technical term for the practice of arranging visual obstacles (usually trees) on either side of the foreground of a image to frame the viewer’s focus on the centre of interest and to present the illusion of pictorial depth. The use of these visual obstacles can also connote the level of illumination in a scene. 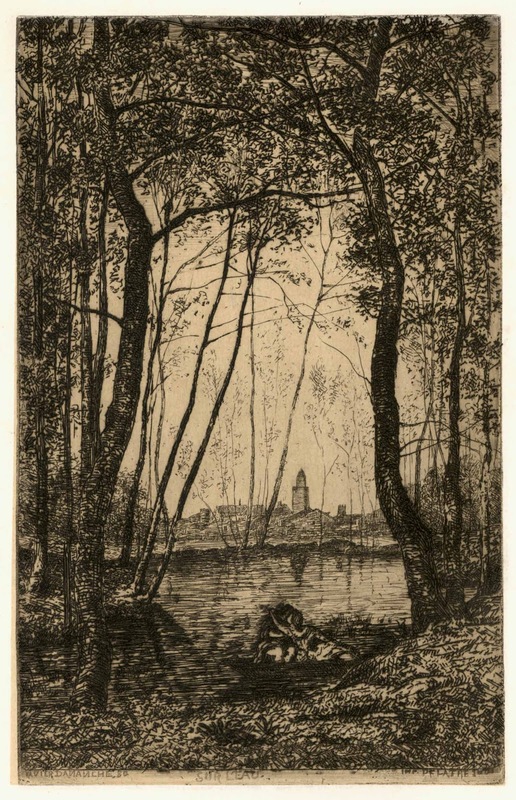 For example, in Xavier de Dananche’s (1828–94) Sur L’Eau (shown below), the lace-like visual obstacles posed by his repoussoir treatment of the trees projects the soft light of twilight (see detail further below). Condition: rich impression on clean paper without stains or blemishes but the sheet has faint age darkening 4 mm from the top. 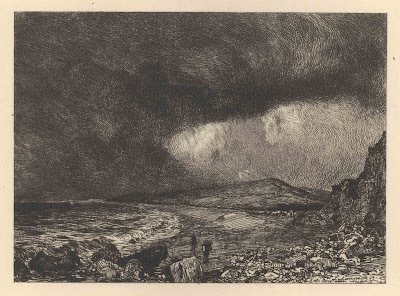 There are pencil inscriptions about the artist (the dates are incorrect) and the title of the print. I am selling this print for $98 AUD including postage and handling to anywhere in the world. Please contact me using the email link at the top of the page if you are interested or click the “Buy Now” button. 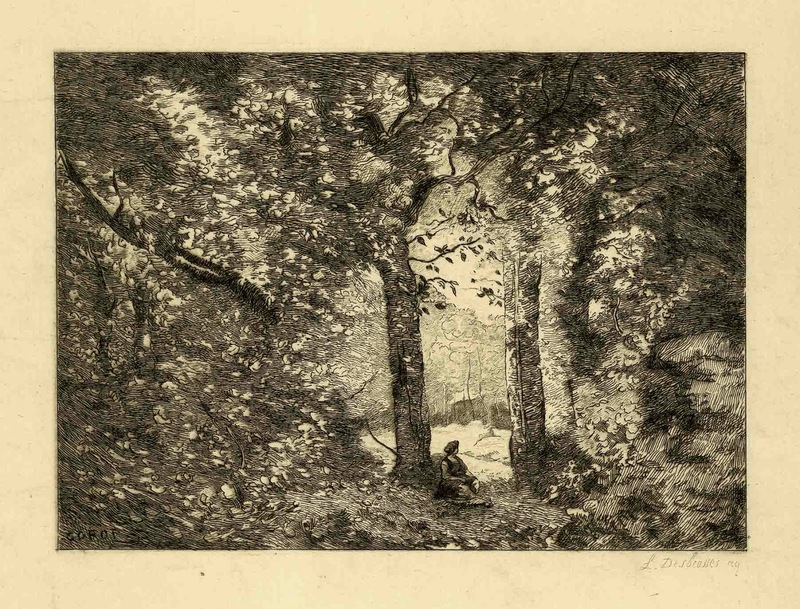 In much the same way, Leopold Desbrosses’ (1821–1908) diminutive in size, but grandly luminous etching, Femme Assise dans la Forêt [Woman Sitting in the Forest] (shown below) features repoussoir interruptions to the distant soft light. By contrast with de Dananche’s approach to repoussoir, however, this print features a very special device: a transition from positive marks where the trees interrupt a view to the source of illumination to negative marks were the foliage in the darkness of the forest reflects the light (see details further below). Condition: superb impression in pristine condition. I am selling this print for $56 AUD including postage and handling to anywhere in the world. The final approach to representing light that I wish to address in this discussion is all about achieving a transition of mark. 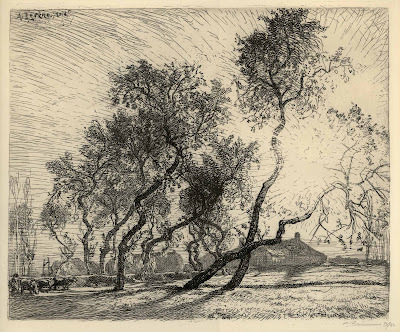 Unlike Desbrosses’ approach of changing from positive strokes in the light to negative strokes in the dark, however, the transition that I am interested in here is to do with changing the inherent attributes of mark to signify changing degrees of illumination. 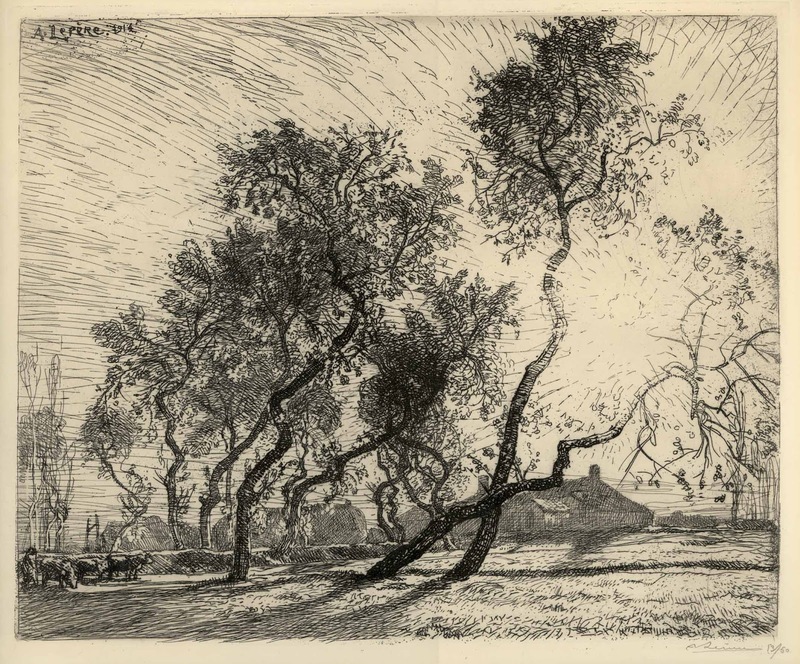 In Louis Auguste Lepere’s (1849–1918) La Ferme aux peupliers de Hollande [The Poplars Farm in Holland] (shown below), for example, there is a clear shift in the types of marks used to depict trees observed in the blinding sunlight compared to similar trees observed outside of the vicinity of blinding light (see details of the comparable effects further below). 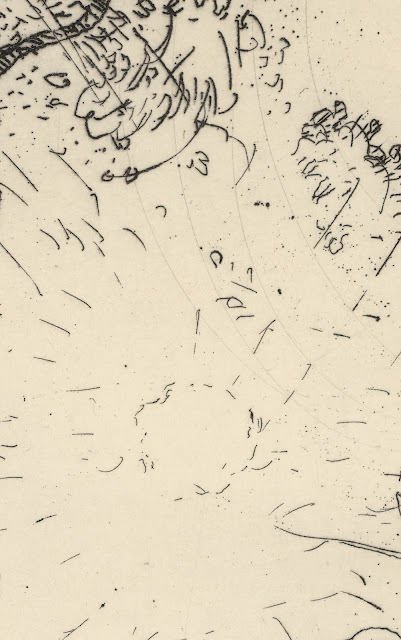 For instance, in the area of intense glare, the marks are short, fine and widely space from one another whereas in the more shaded areas the marks are longer, thicker and so close to one another that they are layered. There is not only separation between these extremes of marks but there is also a sequence of transitional stages linking the two different mark types. 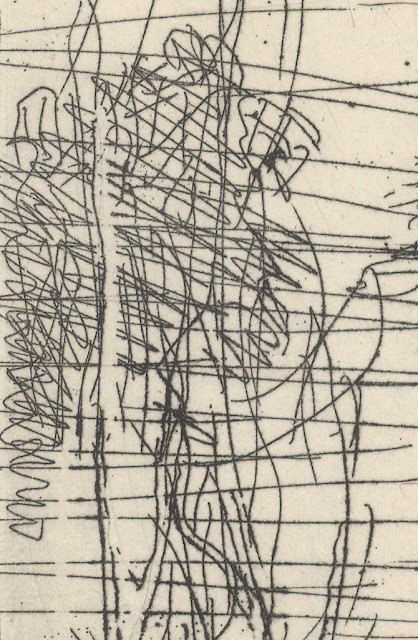 Closest to the light the marks are notational jottings—a few of the lines in this area are straight but more are like tight squiggles (see detail A below). 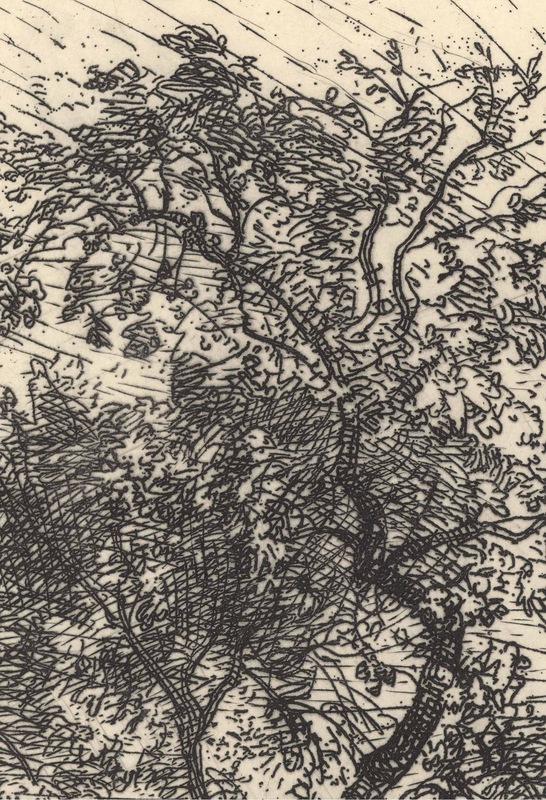 The next stage away from the light is where the structure of the trees is revealed—some of the lines are outlines and many are curved strokes giving fundamental form to the trees (see detail B below). Following this structural stage is the area of half light where the superficial details of the trees are revealed—here the line attributes mimic the textures, surface tones and superficial details of leaf shapes (see detail C below). In the furthest away region the marks become much looser in the sense of free scribbles made with continuous line suggesting a peripheral view of the trees before the scene extends beyond Lepere’s field of view (see detail D below). This staged transition of mark attributes, of course, is usually not a device employed on its own to represent light. As can be seen in Lepere's powerful image, all of the principles that I have discussed above can be seen playing an active role in Lepere’s depiction of intensely bright blinding light almost exploding the stand of poplars. Condition: superb impression. 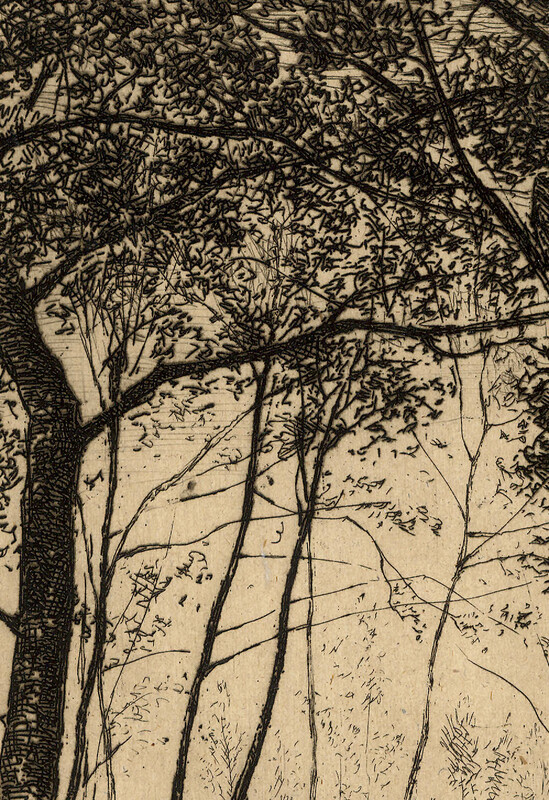 There is faint toning around the plate mark and remnants of mounting hinges on verso. I am selling this print for $460 AUD including postage and handling to anywhere in the world. Be aware that as this is a large print it will be shipped in a tube. Please contact me using the email link at the top of the page if you are interested or click the “Buy Now” button.